An artist's impression of Sirius A and Sirius B, a binary star system. 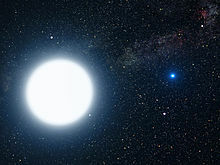 Sirius A, an A-type main-sequence star, is the larger of the two. An A-type main-sequence star (A V) or A dwarf star is a main-sequence (hydrogen-burning) star of spectral type A and luminosity class V. These stars have spectra which are defined by strong hydrogen Balmer absorption lines. They have masses from 1.4 to 2.1 times the mass of the Sun and surface temperatures between 7600 and 10,000 K. Bright and nearby examples are Altair (A7 V), Sirius A (A1 V), and Vega (A0 V). A-type stars don't have a convective zone and thus aren't expected to harbor a magnetic dynamo. As a consequence, because they don't have strong stellar winds they lack a means to generate X-ray emission. The revised Yerkes Atlas system listed a dense grid of A-type dwarf spectral standard stars, but not all of these have survived to this day as standards. The "anchor points" and "dagger standards" of the MK spectral classification system among the A-type main-sequence dwarf stars, i.e. those standard stars that have remain unchanged over years and can be considered to define the system, are Vega (A0 V), Gamma Ursae Majoris (A0 V), and Fomalhaut (A3 V). The seminal review of MK classification by Morgan & Keenan (1973) didn't provide any dagger standards between types A3 V and F2 V. HD 23886 was suggested as an A5 V standard in 1978. Richard Gray & Robert Garrison provided the most recent contributions to the A dwarf spectral sequence in a pair of papers in 1987 and 1989. They list an assortment of fast- and slow-rotating A-type dwarf spectral standards, including HD 45320 (A1 V), HD 88955 (A2 V), 2 Hydri (A7 V), 21 Leonis Minoris (A7 V), and 44 Ceti (A9 V). Besides the MK standards provided in Morgan's papers and the Gray & Garrison papers, one also occasionally sees Delta Leonis (A4 V) listed as a standard. There are no published A6 V and A8 V standard stars. A-type star systems known to feature planets include Fomalhaut, HD 15082, Beta Pictoris and HD 95086 b. ^ Stellar Spectral Types, entry at hyperphysics.phy-astr.gsu.edu, accessed on line June 19, 2007. ^ Empirical bolometric corrections for the main-sequence, G. M. H. J. Habets and J. R. W. Heintze, Astronomy and Astrophysics Supplement 46 (November 1981), pp. 193–237, Tables VII and VIII. ^ SIMBAD, entries on Sirius A and Vega, accessed June 19, 2007. ^ Adelman, S. J. (2005). "The physical properties of normal A stars". Proceedings of the International Astronomical Union. 2004. doi:10.1017/S1743921304004314. ^ Johnson, J. A. (2011). "The Stars that Host Planets". Sky & Telescope (April): 22–27. Wikimedia Commons has media related to A stars.